There are three reasons in my opinion to run: to go fast, to go far, or to go epic. I try to accomplish all three during the week when I run. Speed I usually fail at. Distance I can accomplish if I can carve out the time. Epic is what I hunger for and the reason I truly run. 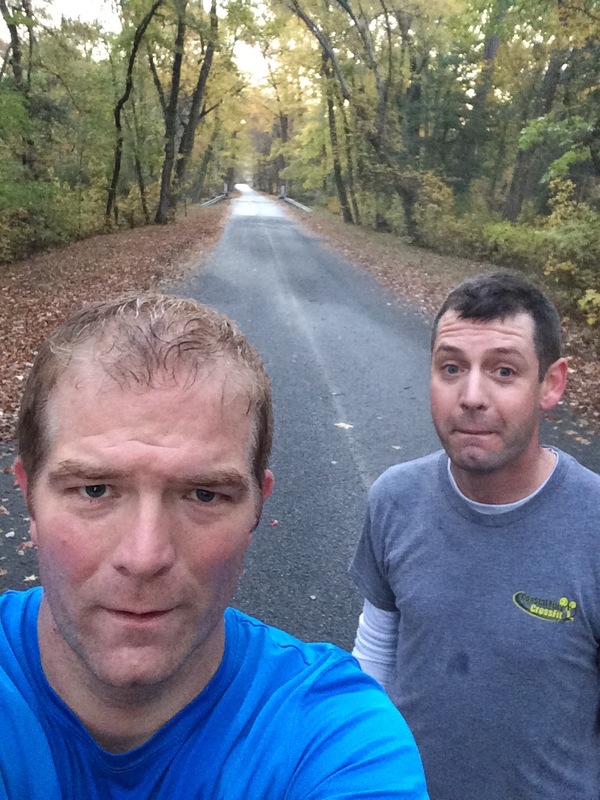 With the changing of the leaves and the cool fall temperatures, Chris and I knew we had to get out and run the country roads of Mt Olive Church road and Sturgess road. The low forties and clear sky outlook seemed ideal for an early morning run and the full moon added a welcomed bonus. It was dark and the streets were empty as I rolled up to pick up Chris at 5:20am. I scarfed down a banana and Chris sipped on some hot brew of some sort as we made our way to Mt Olive Church. We powered up our running apps, and jumped out. Only the moon. Bright, bold and inviting. Headlights on and we were off. A little over a mile into our run we saw a dirt road leading into a thick forest. We should have paid more attention to the Ford F-150 pickup truck and the accompanying four wheeler and realized why they were there. The run was what mattered. Down the dirt road for another half a mile or so we ran and soaked in the beautiful array of colors from the changing trees and the soft rays of light that passes between the branches of the trees as the sun began to rise. Another truck. These people are not here to run or enjoy the autumn beauty. They are hunting… Or better put poaching on government land. We had no plans to get shot. We turned around and return to Mt Olive Church road where we continued our run crossing a small bridge that spanned over a swampy wooded area. The trees were bright yellow and orange and we had to stop and take a few pictures. A quick stop and a few pictures and we were off. Sturgess road, one of the best dirt roads on Delmarva, appeared a few miles further down Mt Olive Church road and we quickly turned left and ran down it until our distance showed 3.1. The dirt felt soft and bouncy under our feet or maybe it was too early to feel anything and we just imagined the feeling of floating after each push off our feet. Wanting a solid 10k before breakfast we turned around and began running back to my car. Forty-three degrees, an empty country road, a good friend, and a breath-taking scenic landscape all added up to an epic run… But we still had three miles to go. The speed increasing with each mile. We opened up and lengthened our strides. Each mile getting faster. Arms pumping and legs churning. No wasted energy spent in talking during those last few miles. A focus and a desire to make the run memorable in every way. The last mile was the fastest. One of my fastest miles ever. We drove back smiling and wasted. Breakfast is always better with miles as an appetizer.